Two things about me: I love arts and crafts and I love organization. While browsing Pinterest, I came across an outstanding project that I wanted to recreate. Never mind the fact that the months will be the same, that is strictly coincidence. However, when I saw this I was like score, this brings two of my characteristics into one place. *does the happy dance* So, I searched for products to recreate this piece, which will lead to more posts, because it didn't work out as well as I had hoped and I have made other projects with the products from those failed attempts. 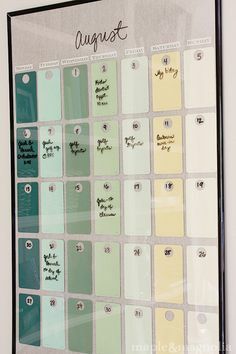 Keep reading to see my take on the DIY Dry Erase Paint Chip Calendar. 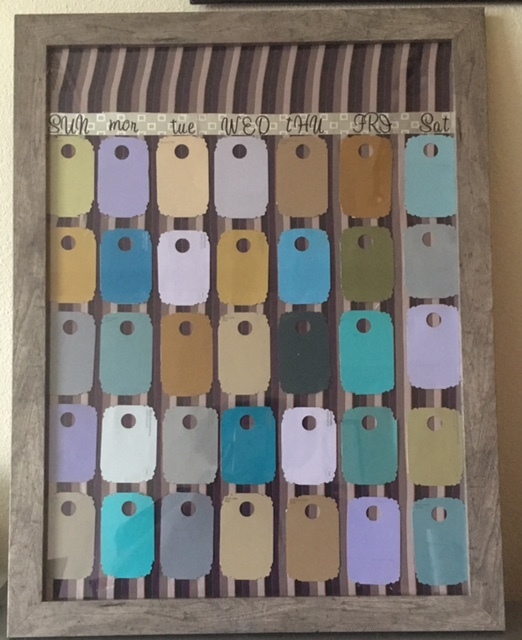 Unfortunately, this project may change as the fabric I chose may not have been the best idea for writing purposes, but it goes well with my desk color scheme. My paint chips all ready to go. I cut out thirty-six just in case, and I stacked them in five rows of seven. While this picture doesn't do this fabric any justice; I chose a fabric that has stripes of purple, gray, black and taupe. I just knew this would work well with my DIY IKEA hack desk; however, this poses a problem further down the list. Next, I got to work with placing the chips on the board, and because I don't do things straight easily (as you can tell from the above picture's lines), I created a line across the top with some pretty silver duct tape that I found at the Dollar Tree in order to try and keep things straight. But as you probably have said looking at the top of the frame, how was I supposed to see the month regardless of what color I wrote it in, and therefore, I made an addendum to the calendar. The issue with this picture is that it caught all of the reflections, including my lights in the ceiling, making it look like something is on the paint chips. But the flash didn't do me any justice either! I hope that the just of the project is able to be seen, but you can also see where my dilemma lies, with writing the dates inside of the punched holes. I can see when I write information on the paint chips, but some of the number of the days are hard to read even with using a light colored dry erase marker. I love the look of the colors, but I am not sure yet if I will just let it be, or recreate the project on a different fabric. You are simply the best. Thanks girl!